Interstate 335 lines the tolled Kansas Turnpike between I-35 at Emporia and I-470 at Topeka. The 50.17 mile rural stretch sees a lone service plaza and interchange (Exit 147) with U.S. 56 near the city of Admire. 2017 traffic counts ranged from 8,770 vehicles per day (vpd) north from Emporia to 9,100 vpd south of Topeka. A number of overpasses along the I-335 section of the Kansas Turnpike do not meet Interstate height standards. Therefore over height trucks are directed off the turnpike northbound at Emporia or southbound at the South Topeka interchange. Interstate 335 appeared for the first time on the Rand McNally North American Road Atlas in the 1989 edition. Interstate 335 lowers in elevation from hills to the southwest of Topeka to enter the city limits at the SW 49th Street underpass. Interstate 470 west & U.S. 75 north serve the west side of the capital city while I-470 east to I-70 & U.S. 40 west serve eastern reaches of the city. Photo taken 06/18/15. Interstate 335 passes under the U.S. 75 freeway leading north from Topeka Regional Airport (FOE) one half mile to the south of the Kansas Turnpike transition to Interstate 470 east at Exit 177. Photo taken 06/18/15. Northbound motorists enter the trumpet interchange (Exit 177) with Interstate 470 west. U.S. 75 ties into Dr. Martin Luther King, Jr. Memorial Highway just to the west, while adjacent Exit 6 connects with South Topeka Boulevard (old U.S. 75) north to Downtown. Photo taken 06/18/15. An end shield for Interstate 335 north stands within the exchange at I-470. Interstate 470 lines the ensuing 6.88 mile segment of the Kansas Turnpike to eastern Shawnee County. Photo taken 06/18/15. Interstate 470 provides a bypass of Topeka and the Polk-Quincy Viaduct section of I-70 by Downtown for long distance travelers headed to Denver, Colorado. Denver is not referenced at the I-70 and 470 split prior however. Photo taken 10/31/16. Traveling through suburban areas of southeast Topeka, Interstate 470 west approaches the trumpet interchange (Exit 177) with Dr. Martin Luther King, Jr. Memorial Parkway, U.S. 75 and Topeka Boulevard (old U.S. 77 north to Downtown). I-335 overtakes the Kansas Turnpike southwest from the upcoming exchange. Photo taken 10/31/16. All over height trucks must exit the Kansas Turnpike at Interstate 470 west. I-335 otherwise bee lines southwest to U.S. 56 between Lyndon and Council Grove. U.S. 75 initially leads south by the turnpike as a freeway to Carbondale. Photo taken 10/31/16. Interstate 470 west utilizes a totso connection at Exit 177 for Dr. Martin Luther King, Jr. Memorial Parkway, a freeway encircling southwest Topeka from South Topeka Boulevard to I-70, U.S. 40 & K-4. 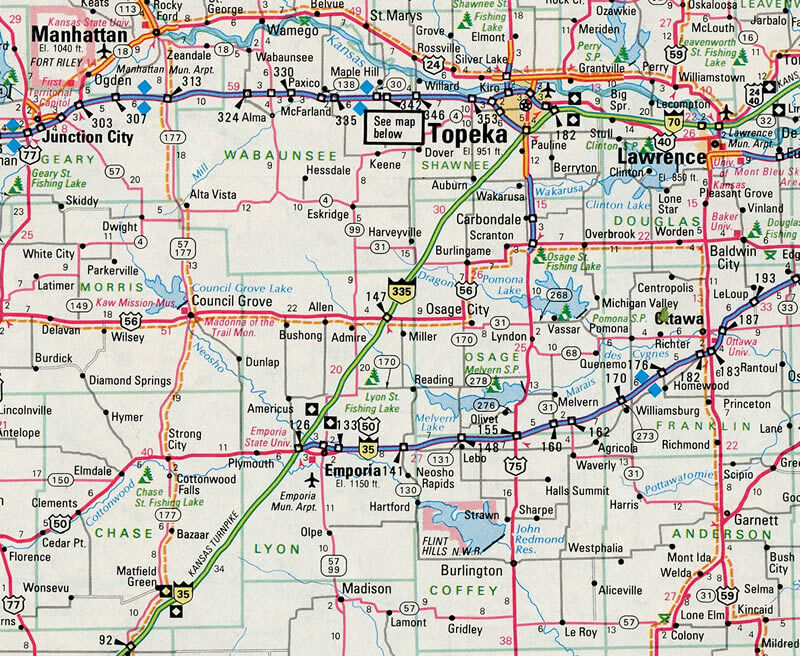 U.S. 75 overlaps with I-470 as part of a bypass around Topeka as well. Photo taken 10/31/16. Previous guide signs for Exit 177 along the Kansas Turnpike west referenced Interstate 70 in addition to I-470 and U.S. 75. South Topeka was replaced with both Topeka and Salina on replacements. Photo taken 10/17/04. The half mile guide sign now references next exit 30 miles in place of last Topeka exit. Interstate 470 returns to I-70 west in 6.69 miles. Photo taken 10/17/04. Interstate 335 takes over for the Kansas Turnpike as Interstate 470 departed to the west to meet U.S. 75. A new sign bridge replaced this assembly by 2007, with South Topeka Boulevard added for Exit 177 signage. Photo taken 10/17/04. U.S. 75 travels 15 miles north from U.S. 50 at Four Corners to Pauline and Interstates 335 and 470 at south Topeka. Photo taken 06/19/15. The U.S. 75 freeway replaced South Topeka Boulevard as the new alignment for the US highway north to Interstate 470. U.S. 75 combines with I-470 just west of the trumpet interchanges for both South Topeka Boulevard and the Kansas Turnpike (I-335 south / I-470 east). Photo taken 06/19/15. This set of shields for Interstate 335, I-470 and U.S. 75 direct motorists onto the freeway access road west from South Topeka Boulevard (former U.S. 75) and Kansas Avenue. Originally a trumpet interchange facilitated movement between the north-south arterial and I-470 belt route. It was removed after U.S. 75 was realigned onto a freeway to the west. Photo taken 10/17/04. After turning from South Topeka Boulevard onto the connector for Interstate 470, this set of overheads separates drivers to I-470 west & U.S. 75 north around Topeka and I-470 east to the Kansas Turnpike (I-335 south). Photo taken 10/17/04. Just beyond the split with U.S. 75 south, Interstate 470 enters a trumpet interchange with access roads for both South Topeka Boulevard and the Kansas Turnpike (I-335 south). Photo taken 10/31/16. Motorists pass through a toll plaza and partition into ramps for Interstate 470 east to I-70 for Lawrence and Kansas City and Interstate 335 south to I-35 for Emporia and Wichita. Photo taken 10/31/16. 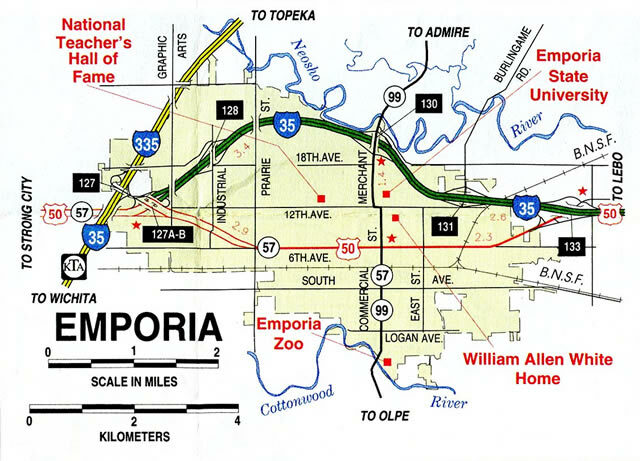 Interstate 335 concludes a 19.84 mile exit less stretch on the west side of Emporia in two miles. The toll road spans the Neosho River on the two mile approach to Exit 127. Photo taken 10/31/16. 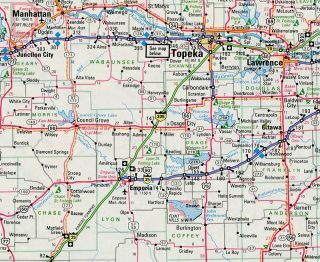 The Kansas Turnpike straddles the western city limits of Emporia from West 30th Avenue to the trumpet interchange (Exit 127) with Interstate 35 north. Photo taken 10/31/16. Interstate 35 travels east across the city of Emporia along the original U.S. 50 bypass. U.S. 50 stays south of the freeway along 6th Avenue while the freeway parallels the Neosho River. Photo taken 10/31/16. Exit 127 loops away from Interstate 335 south. I-35 north & U.S. 50 combine from the east side of Emporia to Ottawa, Olathe, Lenexa and Overland Park. The free section of Interstate 35 was completed in 1974. Photo taken 10/31/16. An end shield for Interstate 335 precedes the departure of Exit 127 and underpass for U.S. 50. Photo taken 10/31/16. The previous set of ramps between Interstates 35 and 335 were located further north. Photo taken by Jeff Royston (03/19/05). The northbound split of Interstate 35 and the Kansas Turnpike prior to the reconfiguring of Exit 127. Ottawa was replaced with Kansas City on sign replacements. Photo taken by Richie Kennedy (03/01). Sign changes made by early 2001 denoted that Interstate 335 will eventually connect to Kansas City via Interstate 70.4 Overheads posted at Exit 127 currently display I-70 with a proper shield in place of the textual reference made in 2002. Photo taken by Ben Prusia. Interstate 35 angles southwest from Industrial Road to a roundabout interchange (Exit 127A) for U.S. 50, before merging with the Kansas Turnpike at the south end of I-335. There is no Exit 127B, as 127A is a leftover from the "spaghetti bowl" interchange. Photo taken 06/17/15. Travelers enter a toll plaza just west of Exit 127A before emerging at the ramp split for I-335 north back to Topeka, and the continuation of I-35 southwest to the Flint Hills and Wichita. Photo taken 06/17/15. Ground level guide sign posted at the original trumpet interchange joining Interstate 35 south with the Kansas Turnpike. Photo taken by Jeff Royston (03/19/05). Prior to the 2006-08 reconstruction, U.S. 50 met Interstate 35 directly at a expansive interchange with left-hand ramps. This connection was replaced by a roundabout and access road leading north to I-35, with U.S. 50 remaining on a separate alignment to the south. Photo taken by Jeff Royston (03/19/05). This sign bridge was posted by the Kansas Turnpike mainline (I-35) overpass on U.S. 50 east. A new on-ramp was added here for the continuation of I-35 south. Exit 127C no longer exists, as a single ramp (Exit 127A) departs from I-35 to the U.S. 50 access road now. Photo taken by Jeff Royston (03/19/05). Shields for Interstate 35 and 335 preceded the directional cloverleaf interchange taking U.S. 50 north to I-35 south. The route was realigned through a single lane roundabout to the south. Photo taken by Jeff Royston (03/19/05). "65 MPH Approved for Route." Wichita Eagle, The (KS), October 24, 1987. "Winter has done little to delay interchange project." Emporia Gazetta, The (KS), January 30, 2007.